Here we go, folks: “Fan Mail Wednesday!” This letter begins with an inadvertent salutation — and a cool statement of purpose. Or should I call you Shirley? 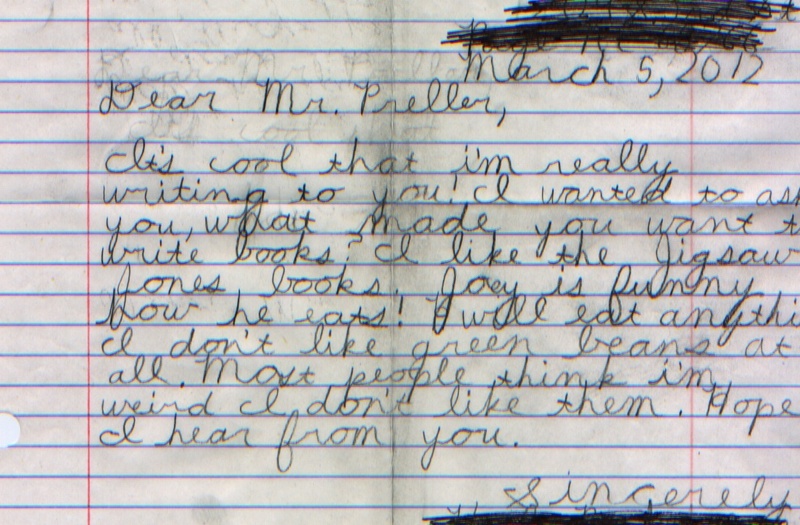 What do you mean addressing this to “Dear Ms. Preller”? That’s Mr. Preller to you! Ha-ha. I thought that was a funny mistake in your letter. At least, I hope it was a mistake. I don’t have anything against girls — I like girls, I do! — it’s just that, well, I’m a boy. Or an ex-boy. Now I’m an old geezer with gray whiskers growing out of his chinny-chin-chin. But in my head, I’m eight years old. I loved the first line of your letter. “I am going to ask you some stuff.” You got right to the point. No messing around with chit-chat. Mila Yeh, Jigsaw Jones, and Ralph Jordan talk on the bus. Illustration by Jamie Smith. I actually did enjoy writing this book, thanks for asking. 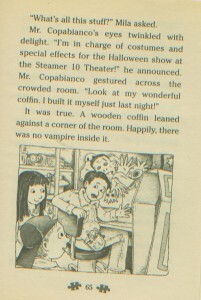 It was a fun mystery, because it combined “slightly spooky” with “very silly.” As for when it was written, all you have to do is look at THE PAGE THAT NO ONE ON THE PLANET EVER READS. Text copyright, © 2004 by James Preller. There it is, the answer to your question. I wrote that book ten years ago. Time flies! 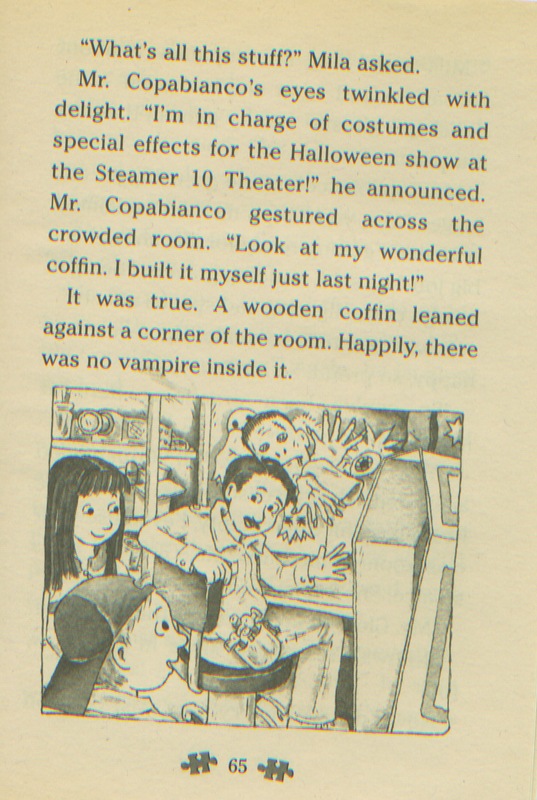 Here our detectives solve the mystery — it was good old Mr. Copabianco, the school janitor, all along. He’s into the arts. The tree house office is actually in Jigsaw’s backyard. In the summer, he works out there, because he loves it. He must like the nebulous heights. In the winter, he moves his office into the basement, next to the washing machine. Mila is Jigsaw’s partner. I think of her as the brains of the operation, while Jigsaw is the one with the unstoppable spirit. He never gives up. Together, they make a great team. 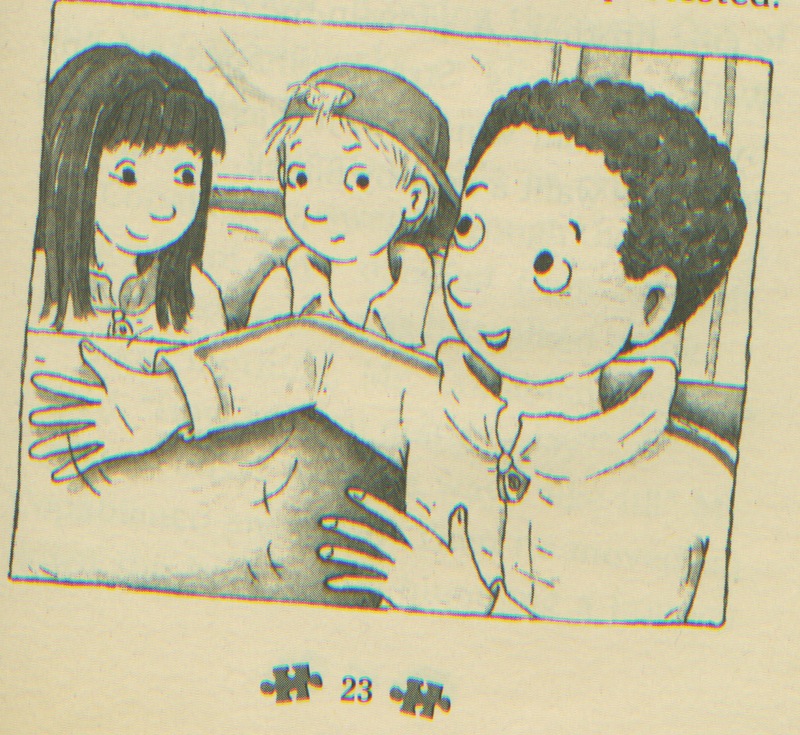 Oh yes, I’m glad you mentioned the illustrations in this book. They were done by a terrific guy who lives in England named Jamie Smith. We’ve never met, but we have exchanged a few emails over the years. I love his work — and I even have a few of his original pieces hanging in my office, nicely framed. Take care. I hope you don’t mind a little good-natured kidding! To mix things up, I thought I’d run a “Fan Mail Wednesday” piece on an actual Wednesday. I think it’s good to keep readers off-balance. So, here’s a good one. I only wish I could share with you the name of the letter writer, it’s just one of those perfect names that authors like me love to steal. Thanks for your wonderful letter, I really enjoyed it. I don’t hear from many students who write in cursive –- I thought it had gone the way of the dinosaurs. 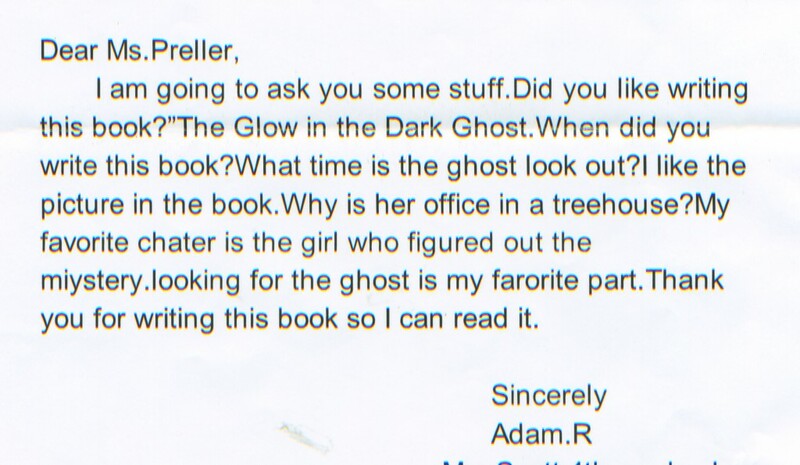 These days I sign my books in print, because I assume that most kids can’t even read cursive. Smart that you picked up on Joey’s eating. There are many characters in the Jigsaw Jones series, 40 books, 250,000 words. I try to make each character complete – an individual. I do that by trying to give each one a few distinct traits. Joey is a little goofy, sweet-natured, and he often takes things too literally, like Amelia Bedelia (as when, in The Case of the Rainy Day Mystery, Jigsaw tells him to “put a tail on Bigs Maloney”). But the real key to Joey is his enthusiasm for food. He eats fast, and usually has a crumbled Oreo in his back pocket. Art by Jamie Smith from The Case of the Rainy Day Mystery. 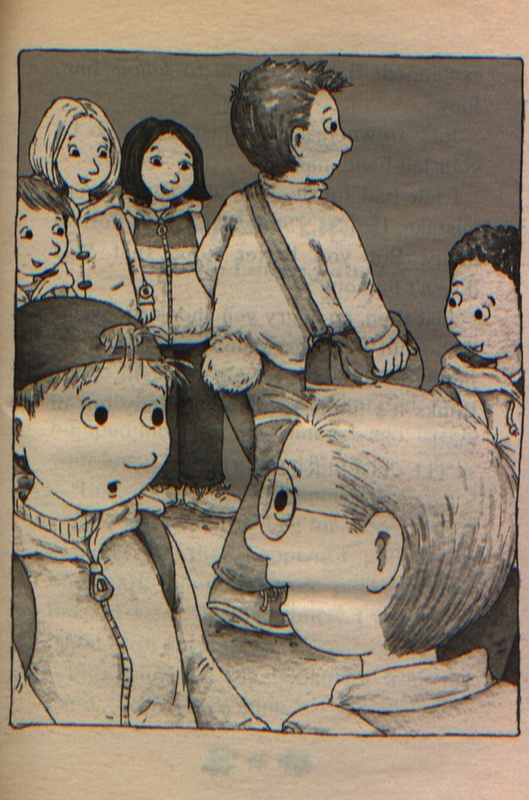 Sadly, it looks like Scholastic has let this most excellent book go out of print. I dream of getting the rights back for these neglected books, and republishing them myself. I know I could sell ’em. So, hmmm, some people think you are weird. Maybe you are a different, I don’t know. But there’s nothing wrong with that. I’m often bored when I meet super-normal people, you know what I mean? I think it’s our quirks and oddities that make us interesting. And believe me, everyone has a little bit of weirdness inside. We’re human beans, after all; it’s our differences that make the world go round. Anyway, as we travel through life, we eventually find and attract the right kinds of friends –- the people who like us for who we are. If someone thinks you are weird . . . so what. You don’t have to “not like them,” but I do recommend not paying much attention to that kind of thinking.